Configuration management is at the core of every service management initiative, driven by the need to understand basic information about each element of the infrastructure required to provide a service, and the relationship between those elements. Today's economic climate reminds management, that initiatives failing to make an immediate and sustained difference through ‘quick wins’ and bottom line impact are vulnerable to deferment, shelving, or abandonment. Configuration management projects are extremely expensive, complex and risk-laden and prime targets. 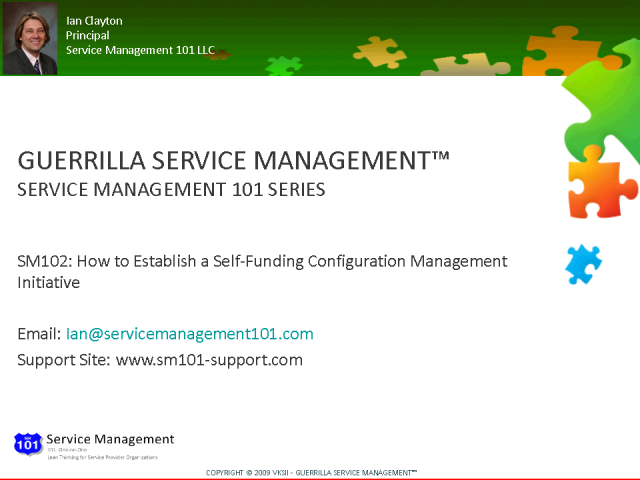 This presentation from the Guerrilla Service Management™ series, provides vital ‘how to’ tactics on the positioning of configuration management within an overall service management strategy, and with key stakeholders. The presentation also discusses the establishment of a self-funding service configuration management initiative.